There has been a new addition to the celebrity label fashion market recently. Jiro Wang who studied Advertising Design and Fu Hsing Trade & Arts College has released an apparel brand called "MUA" which started its pre-order period on February 14. Since he usually likes to sketch and paint, his company is also planning to help him open an arts exhibition. Da Dong loves to draw and design; before entering the entertainment industry, he was a model and clothing stylist. After becoming a singer, he also often happily draws cute cartoons upon the request of media. His new T-shirts feature big red lips. "MUA", the sound of a kiss, hopes to bring lots of love to everyone. "The goal of MUA is to spread a sweet feeling of love that will surround you always. Regardless of whether it's familial love, love from friends or romantic love, you can use MUA to express it! If you're currently in a state of happiness, we hope MUA will add further sweetness to your happiness. If you're feeling lonely right now, then we hope MUA will bring you loving care and be by your side until you find your other half." The official website www.mua-jo.com will be up on March 14, White Valentine's Day. Customers can start registering as members on this day and this is also when the points system will be activated. The first 100 members will each receive a gift. 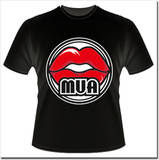 Currently MUA is selling its logo and 'JO' shirts. Its first batch of products will be released late March/April.